This article is a continuation of our series discussing cloud service myths, and the previous LinkedIn publication, Mythbusting: Cloud Service FUD Part 1. We previously discussed the costs associated with cloud services and how to control monthly spend. This article will debunk consumer perception of vendor lock-in. Vendor lock-in is a myth. Plain and simple. It is one of the most significant concerns we hear from customers evaluating cloud services for the first time or from customers with large committed annual spends with a single cloud vendor. Moving your workloads, data, and users between cloud service providers are seamless and moveable at any time with minimal cost. What’s more, Microsoft, Amazon, and Google have been growing their product catalogues at the speed of light. If your sales reps at these companies tell you their platform can do anything and everything that the competitors can, they’re right. Still, the legacy software specializations of these vendors are relevant, so don’t be afraid to leverage multiple providers and move your data and workloads to different vendors for each application. Microsoft Office 365 Exchange Online will always dominate the hosted Exchange service marketplace, Google’s Google Container Engine (GKE) rules the Kubernetes managed service market, and Amazon, as the first mover, has the broadest product and service catalogue. Of course, Oracle Cloud and SAP Cloud have service platforms that offer unparalleled performance for their respective flagship products. 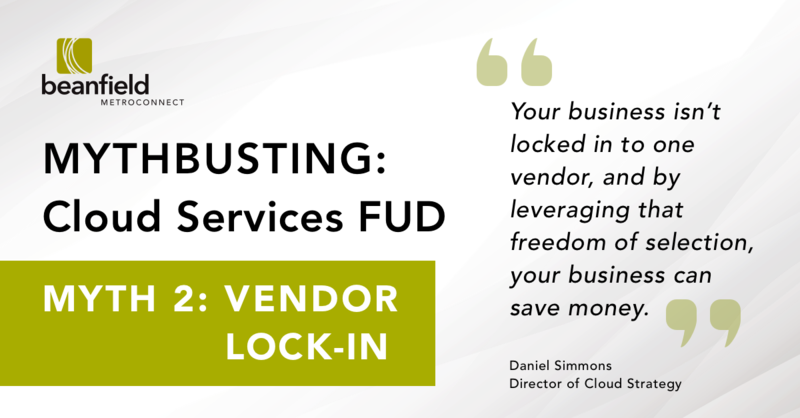 Your business isn’t locked into one vendor, and by leveraging that freedom of selection, your business can save money. Meet quarterly with your cloud service provider sales rep to review monthly spends and keep up to date on changes to product catalogues, services, and pricing. Leverage each vendor for their respective flagship products for best-in-class performance, product knowledge, and service. Legacy database and specialized workloads for mission-critical business applications like ERP, Financial Analytics, and HR perform best in their native cloud environments (Oracle, SAP, and IBM). Migrate workloads to cloud products or services with a clear cross-platform migration path, and leverage Proof of Concept (POC) funding from vendors to test migration and routing of data and network traffic between providers. Leverage native multi-cloud direct connectivity services like Megaport Cloud Exchange, Beanfield Cloud Exchange, PacketFabric, or a data centre based service from Equinix or Cologix to create secure private routes between virtual cloud data centres and your office. In part three of the Mythbusting: Cloud Service FUD series we will discuss Myth #3 – Downtime. You can read the entire series as a single article on Medium here.